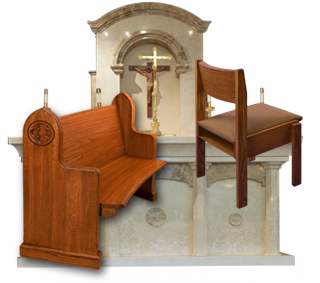 Deluxe Comfort Curve Cushions from Ratigan-Schottler are perfect for churches wishing to replace their existing removable cushions or add extra comfort to their existing pews. When using Deluxe Comfort Curve Cushions there is no need to permanently attach the cushion to the pew. Deluxe Comfort Curve Cushions are custom made to fit the contour of the pew seat; this method of fabrication produces a cushion that fits perfectly in the pew seat. In addition to custom contour fabrication, our Deluxe Comfort Curve Cushions have a non-skid base attached to the bottom of the cushion, this non-skid base not only prohibits movement when weight is applied, it also helps to protect the pew seats finish. In addition to our custom contour fabrication method, Deluxe Comfort Curve Cushions come standard with a 2” high-density polyurethane foam pad. The 2” foam pad provides just enough comfort without adding too much height to the pew seat, thus avoiding the problem of swinging feet. The high-density foam pad is glued to the plywood contour, pressed and wrapped with theater grade Teflon coated fabric. This fabrication method produces a durable cushion that resists fabric wear and wrinkling. Call Ratigan-Schottler today and we will send a sales representative to measure the dimensions of your pew seats contour, depth, and lengths. After the initial meeting, our sales representative will send you a quote and a custom sample cushion. If desired, our sales representative can also provide your church committee with a sales presentation at your convenience. Ratigan-Schottler is now introducing a new line of furniture unique to the industry. Cushion is mounted on a curved plywood base that fits the contour of the pew seat. This exclusive design eliminates cushion movement and does not need to be fastened down. No wrinkle problems, the fabric and foam compessed during construction, tightly stretched and fastened to the bottom of the plywood base. The cushion keeps its shape and does not warp. The high-density polyurethane foam is laminated to the curved plywood base. The quality of foam, fabric and construction is the same high quality that we use on new upholstered seats. There is no bonded (used) foam or second grade fabrics used on any of our cushions.